This textbook is designed for students with at least one solid semester of abstract algebra,some linear algebra background, and no previous knowledge of module theory. Modulesand the Structure of Rings details the use of modules over a ring as a means of consideringthe structure of the ring itself--explaining the mathematics and "inductivereasoning" used in working on ring theory challenges and emphasizing modules insteadof rings.Stressing the inductive aspect of mathematical research underlying the formal deductivestyle of the literature, this volume offers vital background on current methods for solvinghard classification problems of algebraic structures. 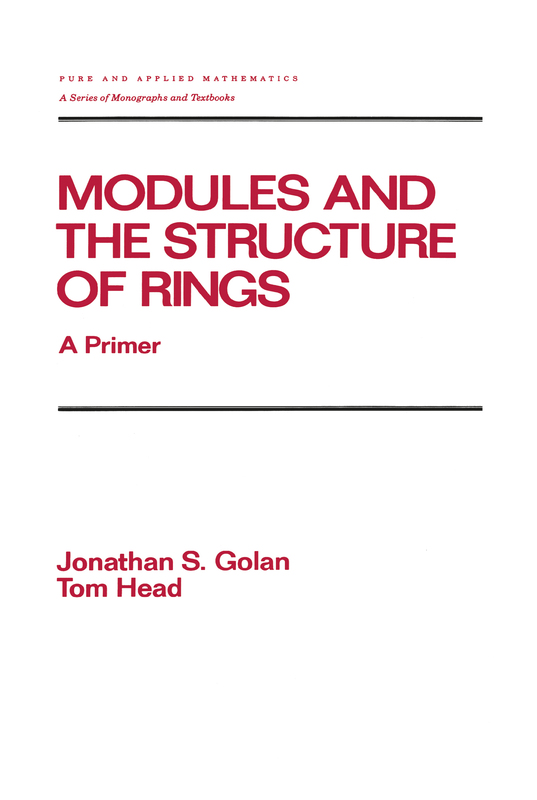 Written in an informal butcompletely rigorous style, Modules and the Structure of Rings clarifies sophisticatedproofs … avoids the formalism of category theory … aids independent study or seminarwork … and supplies end-of-chapter problems.This book serves as an excellent primary.text for upper-level undergraduate and graduatestudents in one-semester courses on ring or module theory-laying a foundation formore advanced study of homological algebra or module theory.